2016 news of Tristan government activities in the UK, Europe and elsewhere in the world. Tristan's UK Representative Chris Carnegy met National Geographic 'Pristine Seas' expedition leader Paul Rose on 25th May 2016. 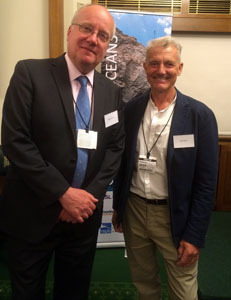 The occasion was a reception in Westminster organised by the Great British Oceans campaign, with Richard Benyon MP. Tristan da Cunha's government, together with the RSPB, is hopeful that a Pristine Seas expedition can come to the Tristan island group in the near future. Photo shows Chris and Paul at the Westminster reception on 25th May. Tristan Administrator Alex Mitham and his wife Hasene arrived at Durban aboard the container ship Gerhard Schulte on 16th May after a six day passage from Tristan. They then flew to the UK arriving by air at London Heathrow airport on 20th May 2016. Alex will attend meetings in London and elsewhere before returning to Tristan for the final part of his three year contract which ends when he departs aboard SA Agulhas II in early October. Sean Burns will return to Tristan for his second term as Administrator in November. Sean departed St Helena (where he was Acting Governor until Her Excellency Lisa Phillips was sworn in as Governor on 25th April 2016) with his wife Marina aboard the RMS St Helena on Sunday 22nd May and will arrive in Tilbury a fortnight later on Sunday 5th June. 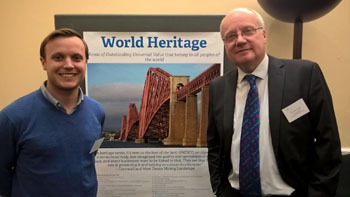 Tristan's UK Representative Chris Carnegy joined the team from UNESCO at an event in London on 20th April 2016. It marked the launch of a study of the benefits of gaining UNESCO designation, and it came at an important moment for the Tristan archipelago. Gough Island, part of our UNESCO world heritage site, is under threat from invasive plants and animals. House mice are attacking the albatross chicks, placing the species in critical danger. Jonathan Hall of the RSPB (pictured with Chris left) is developing a plan to restore Gough to its pristine state. Support from UNESCO, the UK government, and a range of other backers, will be vital to the success of the restoration campaign. 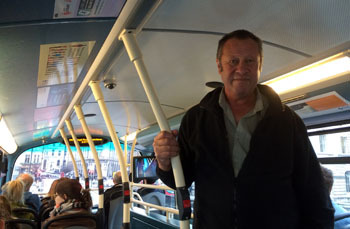 Islander Neil Swain travelled from Tristan aboard MV Edinburgh, departing on 8th March for Cape Town. He flew to London Heathrow where he was met by Tristan Government UK Representative Chris Carnegy later in the month. See more of Neil's trip on Neil Swain's UK Trip 2016. When the Queen, the Duke of Edinburgh and the Prime Minister gathered at Westminster Abbey on 14th March 2016, Tristan's young world-beater Nathan Swain was in focus yet again. 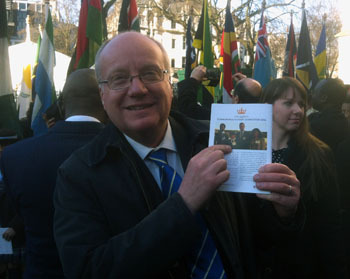 The occasion was the annual Commonwealth Celebration, and the Order of Service included a picture of 11 year-old Nathan as the organisation's Essay Competition junior winner for 2015. Tristan was represented in London at a conference of the social-services leaders from across the UK's overseas territories. The three-day meeting at Lancaster House, running 1st to 3rd March 2016, studied the best ways to safeguard the well being of children. Tristan is currently recruiting for its first dedicated social worker. UK Representative Chris Carnegy joined the gathering to learn from other OTs' experiences and report back to the island. The conference was opened by OT minister James Duddridge, who joined delegates as the sessions got underway. 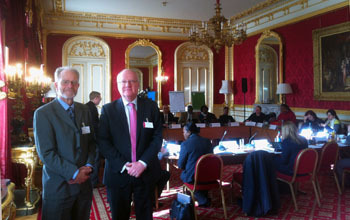 Tristan Government UK Representative Chris Carnegy with Falklands Director of Health and Social Services Ian Bainbridge during the final day of the Lancaster House conference on 3rd March. The All Party Parliamentary Group (APPG) met on 27th January 2016 in the historic setting of a room just off Westminster Hall. It was a chance to hear the views on the Overseas Territories of the new Labour Party foreign affairs team. Shadow minister Fabian Hamilton gave a warm endorsement of the Territories' role in the British family. 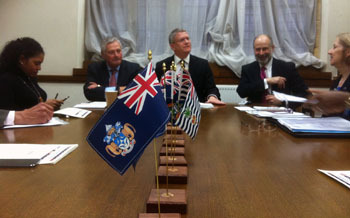 Tristan's flag was on prominent display on the table, and the meeting heard updates on the harbour work and initiatives aiming to boost the island's sustainability, such as the plans to diversify agriculture and improve energy efficiency. Kimberley Durrant (Bermuda), Albert Poggio (Gibraltar), Andrew Rosindell MP (APPG Chair), Fabian Hamilton MP and Sukey Cameron (Falklands). Also on 27th January, the UK Overseas Territories Association (UKOTA) AGM took place in London when Chris Carnegy was re-elected as Treasurer and the new Chair will be Benito Wheatley from the British Virgin Islands. 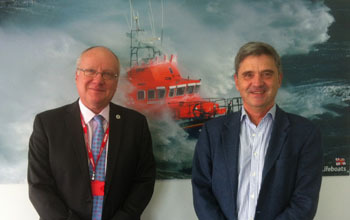 On 19th January 2016, Tristan's UK Representative Chris Carnegy met the chief executive of the RNLI, Vice Admiral Paul Boissier (pictured, with Chris), together with the Institution's International Development Manager Steve Wills. Chris made contact to discuss Search and Rescue refresher training for Tristan, and to explore options for a range of other collaborations. The visit included a tour around the impressive training facilities at the RNLI's headquarters in Poole, Dorset. 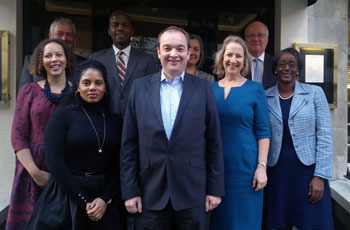 Tristan Government UK Representative Chris Carnegy attended an informal lunch meeting at which the recent Joint Ministerial Council was reviewed with other UK Overseas Territories Representatives on 7th January 2016 in London. The lunch was convened by Overseas Territories Minister James Duddridge who can be seen centre front. Chris can be seen back right as begins his second year working on behalf of the island community.